"Where it All Began: The Firm and the Philosophy"
Have you ever heard people say, "God has a plan, we just can't always understand what it is." When people say that, it is usually after someone has suffered a major loss of some sort, and they are trying to provide some comfort to the person who is mourning the loss. Each of us has suffered a loss (or losses) which we have been forced to struggle through. I want to tell you a little about how, through one of my own "losses," I found my life's true path; the thing that I was put here on Earth to do. It was November 2014. After several years of campaigning, almost non-stop, I gave my concession speech at the Clark County Democratic Party's "After Party." I was surrounded by a crowd of friends, family, and supporters, many of whom had worked as hard (and in many cases harder) than I had. I had run to become the Clark County Prosecutor. It was an open seat that had not been open for twenty-four years. Before I go on, here's a personal fun-fact about me. I don't take losing very well. I am very competitive by nature (and if you know my family, probably by genetic design/defect) at absolutely everything I do (even playing ping-pong). But beyond my normal aversion to losing, there was a deeper reason my election defeat hurt so much. To fully understand it, you have to know a little more about me as I was growing up here in Jeffersonville. Growing up, my family was always involved in public service in some capacity. My dad was the Clark County Democratic Chairman for eight years when I was really young, and he was also an elected office-holder at the county level. Ultimately, he served as a member of the Indiana State Legislature until the day he died, which was in December 2005. My dad's dad, and his dad's dad, were both involved in public service as well. And so, as I was growing up, I was taught from the earliest age the importance of our family tradition of helping to shape public policy in our community and state, in order to make our community a better place. I also learned the stories of my family's success in seeking elected office, and, at least with my dad, I actually saw and participated in his successful campaigns myself. So with that background in mind, my own defeat was more than just losing. It was more than just letting down my friends, family and supporters. I carried an additional weight of letting down the generations of my family who had built a tradition of serving our community, and of being successful in these endeavors. In November 2014, while giving my concession speech, I didn't fully grasp that I was carrying the weight of that burden, but I took it hard. Mind you, the reason I ran for prosecutor is because I really LOVE to do jury trials. No matter how routine a criminal case is, there are never two cases alike. I love the challenge of that. And more importantly, I love the creative energy it takes to put together the facts of a case into a cohesive, understandable, and compelling story. Besides, I had served as a deputy prosecutor for about six years at the beginning of my career, in two different counties. From that standpoint, coupled with my family tradition of public service, running for prosecutor seemed to only make perfect sense to me at the time. Ironically, the job of the elected prosecutor is really not to be a trial attorney. 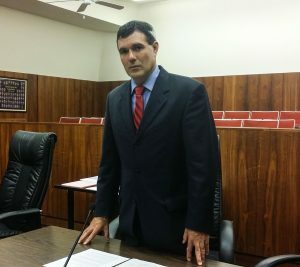 In fact, the ongoing joke around the courthouse about the former elected prosecutor was, if you saw him over on the court side of the court house, you would ask him if he needed directions, because clearly he was lost if he was walking around on the court-side (because he was never, ever in a courtroom!). At least here in Clark County, the elected prosecutor historically served as an office administrator, not a trial attorney. So from that standpoint, since I am passionate about being a trial attorney, my election defeat may not have been the worst thing for me. But more accurately, it was the very best thing that could have ever happened to me. It took me some time to understand that, but I ultimately began to see that maybe there is a greater plan that I really wasn't in control of at all, and that was working for a greater good, for me and maybe even for you. Losing the election was a catalyst for me to make a wholesale change in my life's journey. I opened my own law firm. I started working for the Clark County Public Defender's Office on a part-time basis. After a nearly six year hiatus, I was now in the courtroom almost every day, doing what I love to do, what I am meant to do, fighting for people who are up against what seem to be insurmountable odds. Maybe the most important thing that came out of my "loss" was that it brought me in contact with the person I now see as my own personal Ben Kenobi (you know, Obi-Wan). We all have someone like that in our lives, don't we? Someone we can think back to as being the person who was a mentor, and our teacher. The person who inspired us to rise above the mundane and strive for something greater. Well after twelve years as a trial attorney, I kind of thought I knew exactly what I was doing when it came to being a trial attorney. I have to admit, I was probably a little cocky in that regard. Looking back on it, when I started my practice, I was working with some of the best trial attorneys in the State of Indiana, and maybe the country. I was in St. Joseph County, Indiana (that's South Bend, where Notre Dame is), and I was working as a trial deputy in the prosecutor's office there. At that time, I was really just learning the fundamentals of conducting a trial. I wasn't yet learning what I have come to know as the "craft" of trial advocacy. So, back to my Obe-Wan. October 2015, through the Indiana Public Defender's Council, I attended the Trial Practice Institute. Because of the shear number of trials I had conducted in my twelve years as a trial attorney, I was placed in the "Advanced Class." One of our teachers, Frank Mungo, opened my eyes to the "craft" of trial advocacy. Frank is a trial attorney down in Kentucky. Frank taught me more about trial advocacy during that one week trial course than I had learned throughout the twelve years of my career as a practicing trial attorney. Even better, not only did Frank open my eyes to a whole new way of approaching trial advocacy, but also opened my eyes to a new way of approaching life. Here's what I learned: The key to success in the courtroom is engaging jurors (or any decision-maker for that matter) emotionally. And, in order to engage the decision-maker(s) emotionally, I have to convey my client's life story. While my life's story includes my political defeat back in 2014, from that "loss" I met Frank. And since meeting Frank, I have not stopped in my quest to perfect the art and craft of storytelling. And everything in my life has been affected by this quest. suffers some horrible, tragic loss. Maybe there is some divine plan that we simply cannot understand at the time we are going through it. that plan includes me helping you through your difficulties in life, right now. 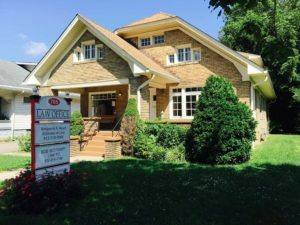 If that plan does lead you to my office here at 410 East Court Avenue, Jeffersonville, Indiana, I'll work tirelessly to make sure the decision-makers in your case know why your case is different and deserves a second look. Call me today at (812) 914-7100 for a free telephone conference.